Size/Color: 9PC/Cherry This item is currently out of stock! Blending the classic aesthetic of traditional design is the Russian Hill Collection. The nod to Old World styling comes in elements such as dental; rope and bead molding; shell motifs and faux marble accent; this dining collection goes above and beyond to create the desired look. 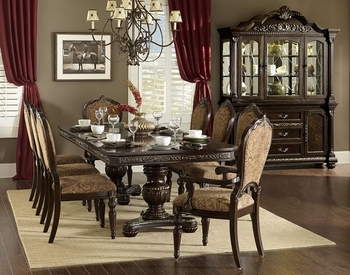 An elegant double pedestal table serves the main course of this refined collection. Acanthus scroll design encompasses the table apron and complement the wood fromed fabric chairs. The stately china stands as the focal point topped with a carved shell accent and elaborate acanthus scroll design. The server features faux marble top; glass and wood door fronts; wine storage as well as service drawers. 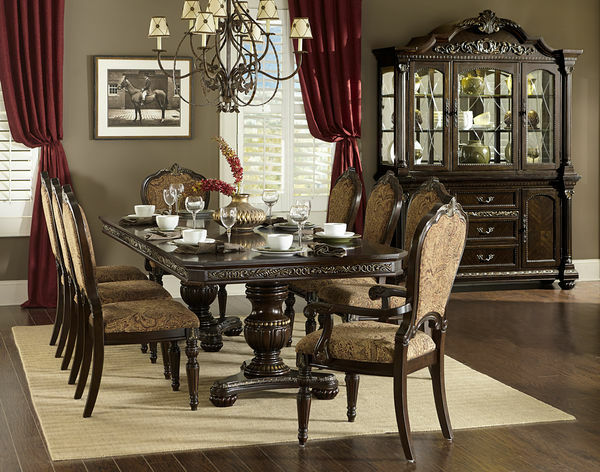 Further lending to the design of the china and server are the fixed antique finished hardware and pilaster accenting in the style of Corinthian columns.The Russian Hill Collection is offered in a traditional warm cherry finish with gold tipping solidifying the interpretation on traditional decor.